Another day, another Google Android-powered smartphone. 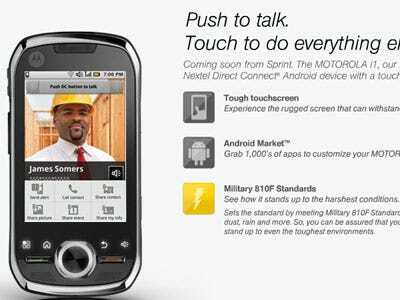 This time, it’s the Motorola i1, the first Android phone that supports push-to-talk walkie-talkie service via Sprint’s Nextel network. Two shortcomings: Motorola confirms to us that the i1 will ship with an old version of Android — 1.5 — though it could eventually be updated over the air. And Motorola confirms the i1 won’t include multi-touch “pinch” zooming — a feature made popular by the iPhone, but present in other Android phones like the Nexus One. These are probably not deal-breaker features for anyone who values push-to-talk more than any other feature — which is likely the only reason they’re loyal to Nextel in the first place. And, to be sure, the Motorola i1 is much better than the vast majority of Nextel phones ever offered. But it’s just one more example of the Android market becoming increasingly fragmented, as different phone vendors ship more phones running different (often outdated) versions of the same software, with different hardware configurations. It’s becoming impossible for a developer to be able to write one app and assume it’ll work the same on every Android phone. Android’s open-source basis and flexible nature may, in the long run, be its best asset. But it is not stopping Android from becoming more confusing to developers and consumers.